Astroturfing—fake grassroots communications about an issue of public interest—is further problematized in digital space. 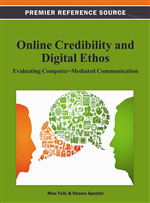 Because digitally mediated communication easily accommodates pseudonymous and anonymous speech, digital ethos depends upon finding the proper balance between the ability to create pseudonymous and anonymous online presences and the public need for transparency in public speech. Analyzing such content requires analyzing media forms and the honesty of speakers themselves. This chapter applies Michel Foucault’s articulation of parrhesia—the ability to speak freely and the concomitant public duties it requires of speakers—to digital communication. It first theorizes digital parrhesia, then outlines a techno-semiotic methodological approach with which researchers—and the public—can consider online advocacy speech. The chapter then analyzes two very different instances of astroturfing using this techno-semiotic method in order to demonstrate the generalizability of the theory of digital parresia, and the utility of the techno-semiotic approach. On May 16, 2010, the French popular science show E=M6 featured a story about “triple play boxes.” A new communication service in France, the boxes allowed users to access the Internet, television, and telephone services at the same time through the same provider. E=M6 achieved its popularity by mixing the points of view of scientists and technicians with discussions of consumer uses and needs—thus, the boxes were well-suited for a story on this program. Every broadcast of E=M6—named for M6, its channel—follows a format similar to this episode, where the broadcast first explains the science behind the broadcast in terms fit for a general audience, and then explores the contextual uses of the boxes. This episode featured a happy French family, a couple with two children, who discovered the features of the box. When the mother called the children for dinner during their favorite cartoon, the box allowed them to pause the program and store it on the box’s hard drive. When the family took a walk, and worried they would miss an evening show, the father programmed the box using his smartphone. In these ways, the family met their entertainment needs thanks to the little box. But shortly after the episode aired, fans and customers, re-watching the episode on M6’s Web site noticed that the box, called a Freebox, was a product available exclusively from the Internet provider Free. Fans began to discuss the show, and the website Freenews.fr, created by an association of Free customers, reported that the family was, in fact, a fake: The “father” was Free’s marketing director, and the “mother” was Free’s press secretary (“La Freebox,” 2011; “Reportage,” 2011). Other Web sites and radio and television news reported the dishonesty; ultimately, the French broadcasting authority, the CSA, warned M6 that its astroturfing attempt contravened articles 20 and 22 from its broadcasting convention: “The company must verify the validity and the sources of information [and] must show honesty and rigor in the presentation and treatment of information” (“Conseil supérieur,” 2011). A core concern of the circulation and presentation of information in public space is one central to the question of authorship and credibility: astroturfing. In this case, what began as a simple five-minute report on a new digital media technology ended in astroturfing practices being exposed by both digital and traditional media. This clear case of astroturfing—and how it was uncovered—allows us to observe the interrelationship between astroturfing, digital media use, and the exposure of astroturfing. In France, much as in the United States, audiences are accustomed to marketing and public relations. The Freebox/M6 case became a scandal not because it was marketing, but because it was misleading—the family that enjoyed the Freebox was parented by employees of Free. These employees violated what we see as a fundamental factor governing digital communication space: parrhesia, in which the public duty of speakers is to speak the truth, to sincerely believe that truth, and to honestly represent themselves when speaking.